We proudly use and sell Handi Quilter and Janome machines. We encourage our customers to purchase machines from an authorized dealer with a Brick & Mortar location. When you buy from an online retailer you will own the box, but no services. When purchasing our machines in the store, we offer free training on the machine, free servicing within the first year, and 20% off Janome accessories. Plus, as we like to say, you get us. Our certified technician and trained educators offer the best in making your machine purchase an all inclusive investment. 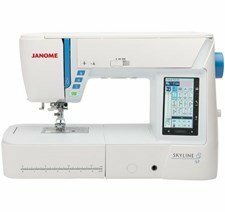 While you are downloading your free embroidery design, scroll down and register to have a free Janome sticker sent to your home. 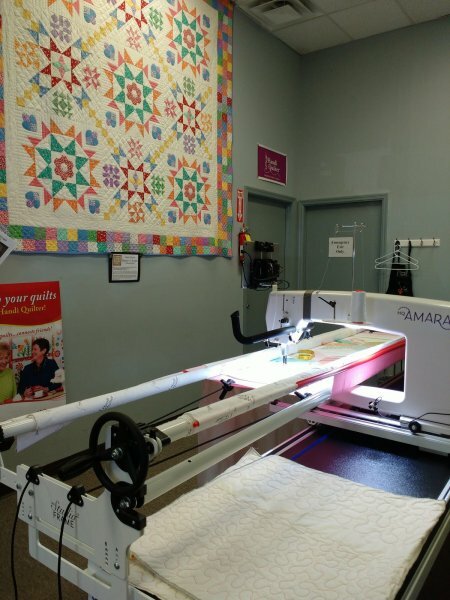 Rental times for using our Handi Quilter Amara Machine are available during our regular business hours. Reservations are required at least 1 week in advance. 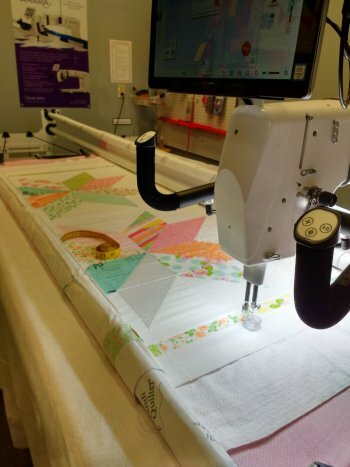 To ensure your experience is successful, we require that every renter be certified on the machine before quilting. This $30 class teaches set-up, loading and basic operation. Generally the class is offered 1:00-2:00pm the third Monday of the month and 5:00-7:00 on the third Tuesday, but please see our calendar for specific details. If the rental dates you see on the calendar do not work for you, please contact the shop and we can work with you to set up a time that works for you. Additional fees may apply for Saturday rentals. We are accepting quilts to finish with an all over meander using our computerized Pro-Stitcher. If you would like custom quilting work we refer our customers to some very capable artists. If you are interested in custom services please contact our shop for details.